The Ngaio Marsh Awards, in association with the New Zealand Book Council and Tauranga City Libraries, invites booklovers to an event featuring three local authors. 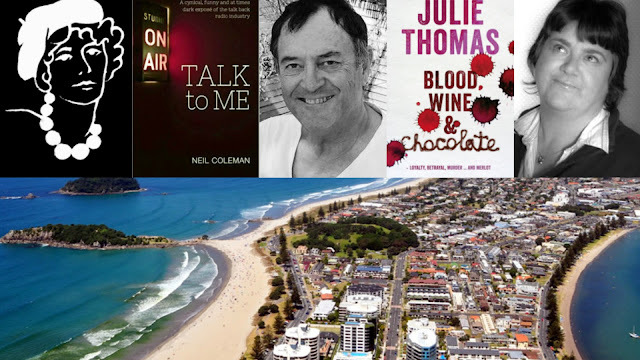 2017 Ngaio Marsh Awards entrant Neil Coleman is joined by USA Today bestseller Julie Thomas and ARTbop Literary Editor Marcus Hobson to discuss what drives them to write, and how they create interesting characters, craft page-turning storylines, and are inspired by living in regional New Zealand. .
Julie Thomas worked in various aspects of New Zealand media for many years. She now lives in Putaruru and is the author of three books, including the #1 New Zealand Fiction bestselling crime novel BLOOD, WINE & CHOCOLATE. Her debut, THE KEEPER OF SECRETS, became a self-publishing phenomenon and then a USA Today bestseller in the United States.